WOW! I just finished using Camille Rose Naturals Coconut Water Penetrating Hair Treatment for the first time, and so far I'm impressed. I shampooed with a shampoo bar, and then, I detangled with a rinse-out conditioner. Once I completely rinsed that, I wrapped my hair in a t-shirt for a couple minutes. Afterwards, I applied Coconut Water in sections. It didn't apply as smoothly as I'd like, but that was probably because my hair wasn't wet enough. It didn't take much product to fully coat my hair. 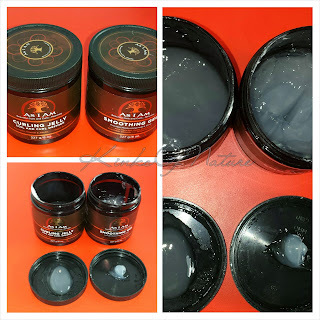 Typically, I use anywhere from a third to a half of an 8oz jar to deep condition. I didn't need that much with this product. It really is concentrated like the packaging states. After leaving Coconut Water on overnight, I rinsed in the morning with cold water. My hair was extremely soft. Although, the product had rinsed cleanly, my hair felt like I had already applied a leave-in and sealed. My hair was so soft, smooth, and shiny! I didn't want to apply anything on top, but I went ahead and did the LOCS method just so I would stay in the habit of doing it. This is just my first impressions, but I will do a full review once I've used Coconut Water a few more times. 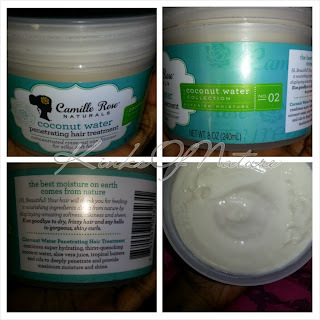 Check out the original post and ingredients list here: New by Camille Rose Naturals: Coconut Water Penetrating Hair Treatment.